Harry How/Getty ImagesLeBron James looked poised to secure his first win as a Los Angeles Laker, only to miss two free throws in the final seconds of overtime to lose to the Spurs. LeBron James hit a miraculous three-pointer in the final seconds of regulation to force overtime against the Spurs, only to fall short in the final seconds of the extra period. At the foul line with a chance to seal the game, James missed consecutive free throws, leaving the door open for the Spurs to win with their final shot. San Antonio found Patty Mills for the game-winner, leaving Los Angeles fans stunned and the Lakers still seeking their first win of the season. It looked like LeBron James had pulled off yet another miracle. 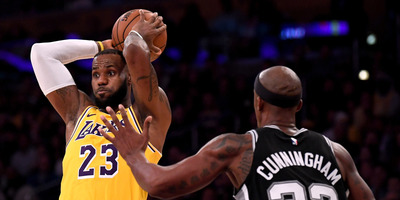 Seeking their first win of the season against the San Antonio Spurs with a short-handed roster due to suspensions doled out to Brandon Ingram and Rajon Rondo, LeBron and the Lakers had trailed most of the game, but pulled within striking distance of Gregg Popovich’s squad late in the fourth quarter. With the Lakers down 128-125 to the Spurs in the waning seconds of regulation, James pulled up for an absurd three-pointer to tie the game. The Staples Center erupted, knowing that this was the first of many brilliant moments LeBron would provide as the new centrepiece of the Lakers. All that was left was to wrap things up in overtime, and with the Lakers building their lead to 139-133 with two minutes remaining in the extra period, things felt locked up for Los Angeles. But the Spurs didn’t quit, with Rudy Gay hitting a clutch three of his own with just 15 seconds left to pull San Antonio within one. The Spurs then fouled James, sending him to the line to shoot two free throws that could have all but iced the game for the Lakers. Still, the Lakers needed only a single stop at the defensive end to get their first victory – would LeBron’s next thrilling play come in the form of a game-saving block or steal? Unfortunately for Los Angeles fans, it would not. After advancing the ball with a timeout, the Spurs ran a crafty inbound play to get Patty Mills open for the game-winning jumper. The Lakers had a few seconds left to try and manage another potential game-saving shot, but James couldn’t connect on a second pivotal jumper, and the game went final, with the Spurs winning the shootout 143-142. James will undoubtedly have more chances to stamp his place in Lakers history, but the script looked perfectly written for him to do it on Monday night, and to see him falter was jarring to anyone whose watched him perform miracle after miracle on the basketball court over his storied career. The Lakers will try for their first win of the season again on Wednesday night when they travel to Phoenix to take on the Suns.